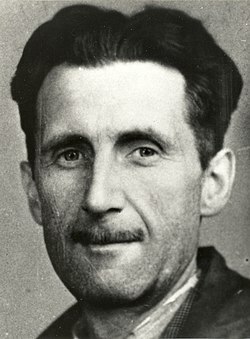 George Orwell, þæs sōþ nama is Eric Arthur Blair (ƿæs geboren þæs 25. þæs Ǣrran Līðan þæs 1903. gēares on Motihari on Indie - cƿæl þæs 21. þæs Ǣrran Līðan þæs 1950. gēares on Lundene on Englalande) ƿæs Englisc spellƿrītere, tīdunge cȳðend, and bōcgelofiend. Hē is ān þāra brēmostena Engliscena ƿrītera þæs 20. hundredgēares. His gecūðost ƿeorc ƿǣron geƿriten nēah þǣm ende his līfes: Animal Farm and 1984. Þā ƿeorc cīdaþ þearle ƿiþ Iosepes Stalines dǣda and eall ānƿeald. Man nīwanost wende þisne tramet on þǣre 02:56 tīde þæs 29 Ēastermōnaþ 2018.